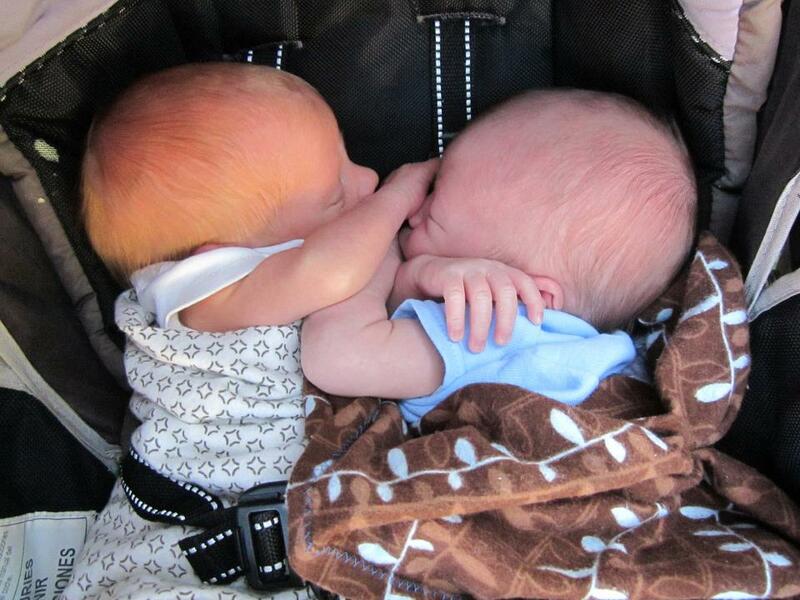 When the twins were first born they both fit in one single stroller and routinely fell asleep tangled together. They sit side-by-side on the paper covered exam table, ready for their annual pediatric well-visit. Clothed only in their Super Hero tightie-whities, they're “skin-skin-skin” everywhere. Impossibly long legs dangle, long arms stretch, and bright little-boys faces gone round and full again in a growth spurt, shine. They're barrel chested, broad shouldered men-in-the-making at four-years-old. His face shines with delighted disbelief. “Is that true?” he demands. When the doctor comes in she begins by asking them questions and they jostle and jockey between themselves to be the first to reply, the one to give the most detailed answer. Part way through the questions Levi pipes up out of turn. My husband and I laugh, he’s right. The doctor assures them an exam will follow. While they talk the boys, first seated at separate ends of the table so the nurse would be sure not to confuse them, shift closer together. Levi skootches the length of the paper sheet until he’s snuggled in at Isaiah’s side, nearly knocking his brother off the table. Half-naked they huddle there, skin to skin intuitively finding comfort in each other in the midst of their vulnerability. Watching, I am reminded it has always been this way. First home from the hospital (and for months to come) we laid the twins to sleep together in a bassinet or crib. Unable to roll, to move really at all, like every newborn, we were careful to place them swaddled a foot or so apart, worried they would somehow suffocate each other. Returning to check on them in the night, though, we almost always found them tucked close together, their heads turned into the familiar scent and warmth of the other. Unable to move hardly at all, unable really even to see, they each somehow shifted until their faces touched, their warm, milk-scented baby breath mingled together. This morning I am sitting with the wonder of these boys, the way they allow vulnerability to draw them closer together rather than push them apart. In the wake of this weekend's terrorist attacks, in the light of so much fear and struggling world round and in our very own hearts, I am left with some simple questions . . .
What will I do with my vulnerability? What will we do with our vulnerability? Will we allow it to draw us closer together or push us further apart? Such good questions for a day when we wonder how a city a whole ocean away can occupy our thoughts so completely. I am in awe of mothers of twins. My two closest-in-age are 22 months apart, and that felt overwhelming at the time. Now, of course, they are the best of buddies and accomplices. Amen, Kelly. May we all draw closer & find strength & courage. Just beautiful to read today! Oh, that we would draw nearer to one another and to the Lord. You have given me pondering material with a great visual in the twins. “Wait! If she’s just talking to us, why do we have our pants off!” I LOVE THIS!! Loved reading about your twins, Kelly, and marveled at their ability to wiggle together as swaddled infants. Amazing! And what an appropriate parallel you drew to our own vulnerability, and how it can be a means of bringing us together. Reminds me of an old song we used to sing: "Bind us together, Lord, with bonds that can never be broken." I love the way you find beautiful heart questions and answers in your right-at-your-fingertips world. I love this post, Kelly! It made me think of another Kelly in my life - the new Bible study leader who took over as the other veterans stepped down. In the past two weeks she has been vulnerable and shared her story - not a testimony from years past - but her right now, life is hard, story... and pushed through the fear of judgment and rejection... and my how I am so thrilled to see so many surrounding her and pushing in... drawing near - to her, and to God! Beautiful! This is just beautifully written and the ending is profound, wonderfully said.